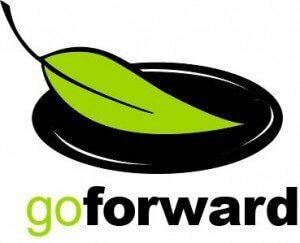 This is my first time ever participating in Virtual Vegan Potluck. Everyone brings a virtual dish to the potluck ranging from entrees to desserts and you can use the buttons at the bottom of this post to navigate your way through the whole potluck. Before we start – let me introduce myself. My name is Katherine and I blog at Green Thickies. A Green Thickie is a meal replacement green smoothie. If you’re interested in learning more about Green Thickies – click here to learn more. The dish I have chosen to bring to the potluck is Homemade Chocolate Pudding with orange and topped with whipped coconut cream. Yum! The best thing about this homemade chocolate pudding is that it’s healthy – so you don’t have to worry about overindulging. It is free from refined sugar, dairy and made with whole natural ingredients. Another bonus about this chocolate orange pudding is that it only takes 5 minutes! What more could you want when the chocolate cravings strike? 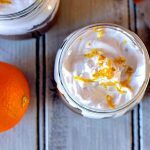 This gorgeous dessert can easily be made with store cupboard ingredients and an orange – so you can whip it up without any extra trips to the store or trying to find special ingredients. I have recently got myself a magic bullet – which is just perfect for making this chocolate pudding. 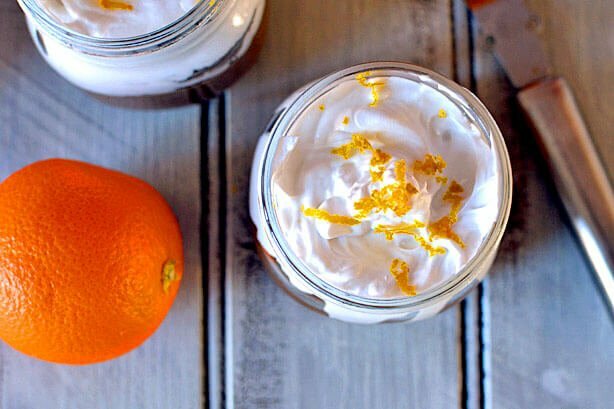 It comes with so many attachments that you don’t even have to wash out your containers – just use one container and blade to make the chocolate pudding and another container and blade to make the whipped coconut cream. If you don’t have a magic bullet you can use either a normal blender, food processor, mixer or electric whisk. (affiliate links) At a push you could even use a hand whisk or a fork – but it might not be quite as smooth. 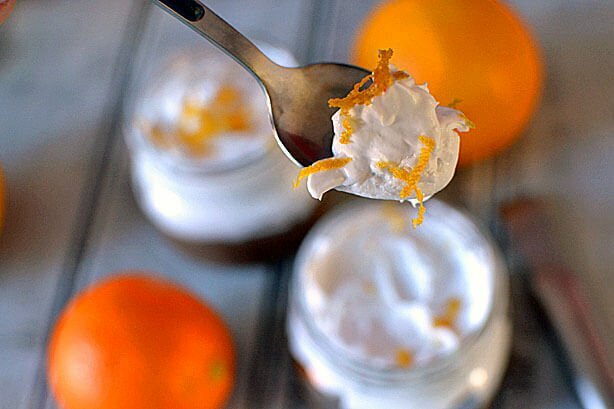 This healthy homemade Chocolate and Orange Pudding with Whipped Coconut Cream can be ‘whipped up’ in less than 5 minutes! Leave the Can of Coconut Milk in the fridge overnight. Add the coconut cream to the top of the Chocolate Pudding. You can store this in the fridge for up to 2 days. Which do you prefer Cocoa, Cacao or Carob Powder? 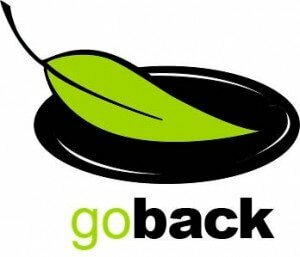 Check out the rest of the Virtual Vegan Potluck by either clicking to go forward to the next recipe, back to the previous recipe or click the Virtual Vegan Potluck button at the bottom to begin at the start of the potluck. Enjoy! boy does that look good……… i have yet to make a dish with chilled coconut milk….. I adore the chocolate and orange combination! This looks divine! Oh my goodness. This looks so good! Especially with that coconut cream on top. 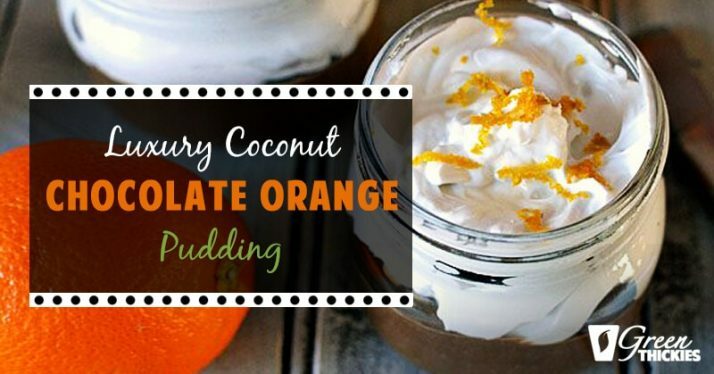 I love that this pudding is made with bananas as the base, too—and I bet the orange and chocolate together keep it from tasting too overwhelmingly banana-y. Great recipe! Thanks Allison – yes I couldn’t taste the banana at all. It makes a really healthy base. I especially love the preponderance of cream on top! So beautiful. Glad to have you along for this Potluck, Katherine! Thank you Annie and thank you so much for inviting me, and all your hard work involved in hosting this great event! Thank you Liane – those brownies sounds gorgeous! This looks so good. 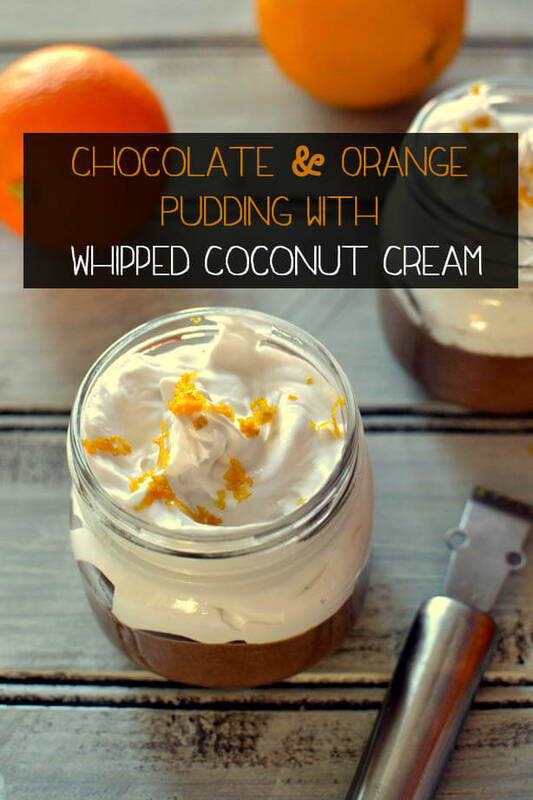 The combination of orange, chocolate and coconut cream – yummm! Wow! This looks amazingly delicious! I like that you sweetened it with maple syrup and fruit, too. Thank you for such a lovely and tasty recipe! This is so unique and I can’t wait to make it! Oh this looks so delicious! Chocolate and orange are one of my favourite combinations. Definitely tagging this for later!